At Nuremberg, Germany 4,000 MAN Truck & Bus employees produce 100,000 engines annually and shipped worldwide. MAN Engine production are manufactured here from six-cylinder in-line to eight and ten-cylinder ‘V’ engines. All of the major components are manufactured at the plant including the crank case, bearings, head and con rods. Assembly is by electronically controlled robotic arms and a key part of the production process is the continuous monitoring of measurement and checks for any potential leakage. In order to ensure and guarantee maximum cleanliness, con rods are vibrated to an ultrasonic range so that even the smallest particles are removed. At the end of the process the final test takes 20 minutes where emission’s, noise and performance levels. A recent development is the use of a cold test on engines, this is more environmentally friendly. Unfortunately as of now, this process can only be used on marine and rail engines. MAN also manufactures natural gas powered engines and is market leader in Europe for CNG powered buses. On the same site, the MAN Engine Academy is both a training centre for young trainees and a development centre for future technologies. Training is for beginners and for those wishing to update their skills and while most of the training is standard, tailor made courses are provided when required. 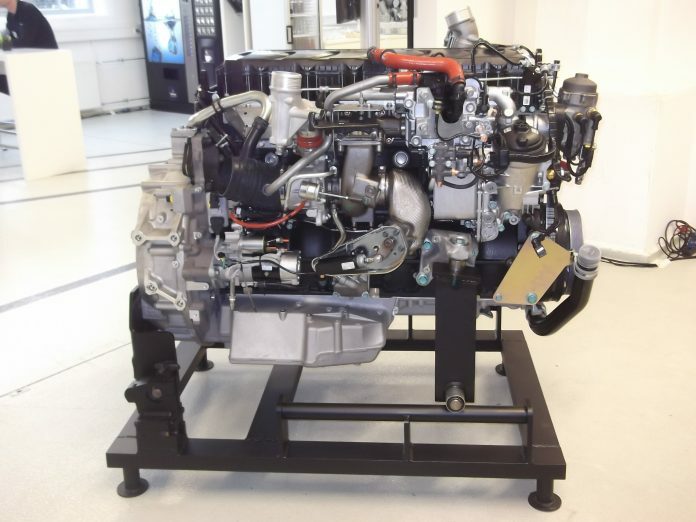 All engine development is based on reducing emissions and improving efficiency.